The tide seems to be turning for the euro zone and the ECB so I’m switching to a bullish EUR bias from here. EUR/CAD already made a pretty strong upside break, but I think I can still catch a pullback. A few days back, EUR/CAD broke past the long-term range resistance around the 1.4200-1.4250 area on rising U.S. oil stockpiles and a less downbeat ECB statement. As it turned out, Governor Draghi is seeing no urgency in terms of increasing their stimulus efforts since deflationary risks are disappearing. He also brushed off concerns about political uncertainties in the region as elections are lined up for a few member nations throughout the year. Even though the Loonie got a bit of a boost from stronger than expected Canadian jobs data last Friday, the commodity currency could still get bogged down by risk aversion and expectations of weaker energy demand. After all, the looming Fed interest rate hike could keep a lid on spending and investment activity around the world, leading to lower production. Applying the Fib tool on the swing high and low on the 4-hour time frame shows that the 38.2% level is close to the area of interest at 1.4200. I’m gonna go for a conservative pullback entry right there, but I’m also getting some skin in the game by going long at market on that short-term rising trend line in case the pair barely looks back from its climb. I’ve got a pretty wide stop below the 61.8% Fib and below the halfway mark of the range around the 1.4000 major psychological level. Stochastic is still making its way down, which suggests that a correction from the climb is in play for now and that any of the Fibs might hold as a floor. 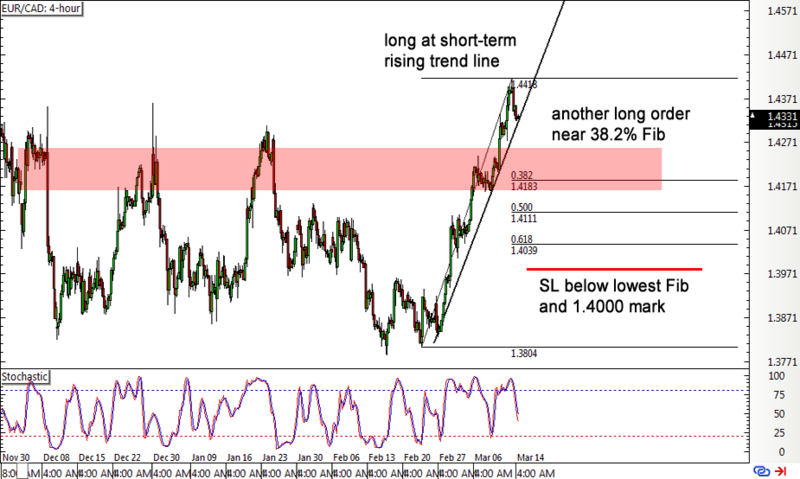 As for my profit target, I’m setting my sights on the next long-term ceiling near the 1.4900 mark. Long EUR/CAD at market (1.4325) and at 1.4225 for 0.25% risk per position, stop loss at 1.3975 and profit target at 1.4875 for a potential 2:1 return-on-risk.